Spooky Canyon is the unofficial name of a minor, relatively shallow drainage at the edge of the Black Mountains, on the east side of the Colorado River a few miles from the Hoover Dam. 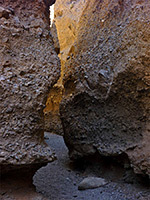 The wash forms a short slot canyon through grey, conglomerate (or 'fanglomerate') rocks, only a third of a mile long, but surprisingly pretty, and quite dark in a few places due to overhanging rocks; the canyon walls take on an pleasing orange-yellow tint when illuminated by reflected sunlight. Doubtless there are dozens of similar ravines in the desert-like hills that surround this section of the river (Lake Mohave), and northwards along the shoreline of Lake Mead, but this one has been publicized since it starts right beside US 93, and is reached by a short walk from the White Rock Trailhead, the start point for hikes to Lake Mohave and Arizona Hot Springs. Probably fewer than one in a hundred people visit the slot, however, though its dry gravelly floor does show plenty of footprints. 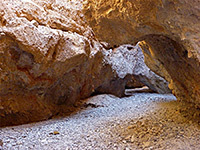 Other narrow canyons near Lake Mead include Lovell Wash to the north, Goldstrike Springs Canyon near the Hoover Dam, and several on the west side of Lake Mohave accessed by Hwy 165. 19 views of Spooky Canyon. The White Rock Trailhead along US 93 has a large new parking area with space for 50 or more vehicles, constructed as part of the Hoover Dam Bypass Bridge Project in 2010. This location is 3.5 miles southeast of the bridge, and 10.5 miles north of the turn-off to Willow Beach. The surroundings are low, undulating, stony hills bearing very little vegetation, crossed by numerous washes and little ridges. 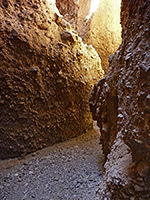 The drainage forming the slot canyon meets the highway half a mile northwest, and walking is easiest right beside the road since away from the highway, the land is sloping, steep in places, with one relatively deep ravine to cross before reaching the slot, and some of the surfaces are covered by loose stones. But even walking this way, cross-country, it only takes about 15 minutes to reach the slot, in the third major drainage west of the parking lot. 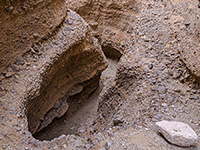 If walking along the road, the canyon is entered by climbing over the highway fence, or slipping under a few places where holes have appeared, then scrambling down to the streambed. 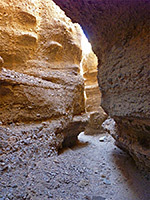 The Spooky Canyon slot forms just a few feet from the fence at the edge of the highway. The lower end contains a few trees, bushes and flowers such as rush milkweed, but most is entirely free of vegetation. A very short, twisty side slot joins from the north, soon after which the main branch narrows further, and is wider in some places below, due to undercutting, hence some short stretches are rather dark. 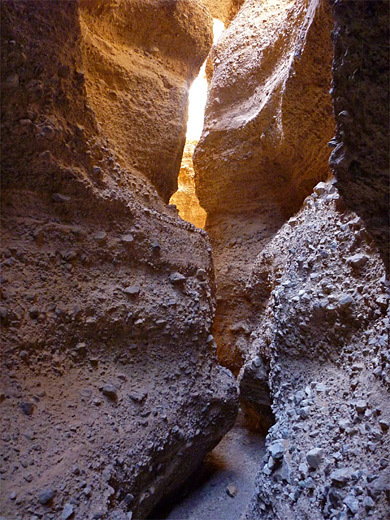 More narrows are followed by a brief wider stretch where a sloping gully joins from the left (usable as an entry/exit route), before the start of the deepest section. 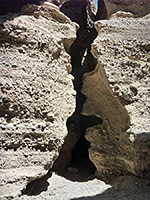 A twisting side crack appears on the north side, below a natural bridge, and leads to the best part of the slot, deep and enclosed, with overhanging rocks at the top and nicely eroded walls at either side. The confined passageway soon ends at the base of a high pour-off. 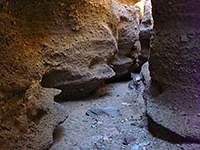 The main canyon eventually has a dryfall of about ten feet, easily climbed since the protruding pebbles in the conglomerate rock are firmly embedded, and act as footholds. Soon after is a taller drop, less easily climbed, but this marks the upper end of the slot and there doesn't appear to be anything of interest beyond.